So yesterday night as I was starting to type this post, I realized that this was my last official week of vacation. NOOO!!!! Summer where did you gooooo!!!! I officially start work on Monday in Houston. TX! I know come Sunday, I'm gonna have those "First Day of School" jitters. Which I will then have again for the rest of the Mondays in August since the following Monday is my first day at my new school and then the Monday after that is the first day of school with students. So there's that! 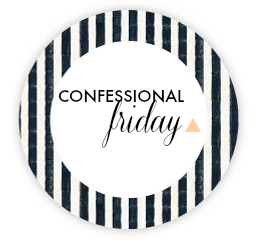 Now the last couple Friday's I've loved linking up with Leslie for her Confessional Friday and today is no different. I confess that I'm a little nervous to start all over at a brand me school. I had a pretty sweet set up last year in Florida and it's gonna be pretty tough to find a better team than the team I had at ERHS. I miss them dearly. I confess I gave in and purchased an Erin Condren planner for the new school year. I am super excited! But am a little bummed because the expected ship date isn't until August 27th, which means I wont be getting it until the first of September sometime. Obviously mine will say my name and not "The Williams". I don't know who they are. I confess I have dubbed this the "summer of the ponytail". I'm not a big fan of how my hair look pulled back. But this has been a super lazy summer for me hair/makeup wise and I just cannot be bothered to actually fix it. It also doesn't help that I am very frustrated with my hair lately. I just don't like the way it's falling when I actually fix it. I confess I'm super excited to re-decorate my room and new house. When I moved back to Texas I literally sold ALL my furniture. I literally have zero things to put in my room. For the rest of the month I'm gonna be sleeping on the floor on a twin mattress with shark sheets. I wish I had a picture to show you but sadly I do not. My Pinterest has been blowing up with ideas though and I'm super excited to buy new stuff. I confess I am still incredibly ecstatic that my Instagram picture is going to appear in the September issue of Cosmo. Here's the picture again in case you need reminder! I can't stop smiling about it, nor can I stop telling people. People are probably super annoyed with me because I bring it up so much. I confess I have a HUGE secret that I am absolutely DYING to share with every single person I know. I have to keep it a secret just a little bit longer though and then I will be shouting it from the roof tops. It is such good news I'm about to burst sitting here typing this. K....now I'm off to spend the rest of the day watching Grey's Anatomy on Netflix with my best friend. It's my last Friday to be uber lazy so I'm gonna take full advantage!